The Theory of Attachment & Separation Anxiety. The theory of attachment was originally developed by John Bowlby, a British psychoanalyst who was attempting to understand the intense distress experienced by infants who had been separated from their parents. Bowlby observed that separated infants would go to extraordinary lengths (e.g., crying, clinging, frantically searching) to prevent separation from their parents or to re-establish proximity to a missing parent. Bowlby believed that these attachment behaviours, such as crying and searching, were adaptive responses to separation from with a primary attachment figure--someone who provides support, protection, and care. Because human infants, like other mammalian infants, cannot feed or protect themselves, they are dependent upon the care and protection of "older and wiser" adults. According to Bowlby, the attachment system essentially "asks" the following fundamental question: Is the attachment figure nearby, accessible, and attentive? If the child perceives the answer to this question to be "yes," he or she feels loved, secure, and confident, and, behaviourally, is likely to explore his or her environment, play with others, and be sociable. 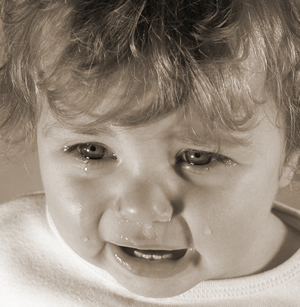 If, however, the child perceives the answer to this question to be "no," the child experiences separation anxiety and, behaviourally, is likely to exhibit attachment behaviours ranging from simple visual searching on to active searching and crying. In such cases, Bowlby believed that young children experienced profound despair and depression.